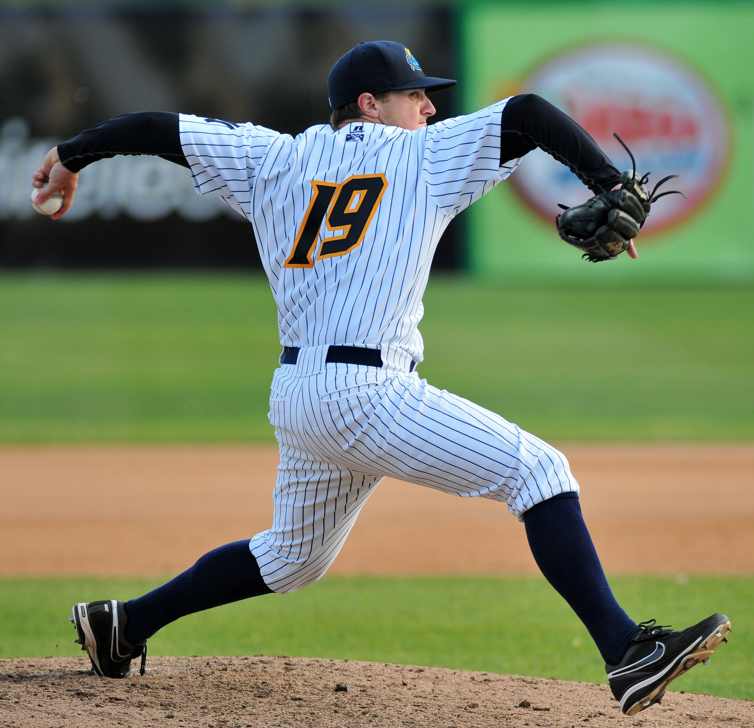 One of the key indicators of efficiency and power in a pitcher’s delivery is his use of his lower half. At The Florida Baseball Ranch, we’ve been studying this for a long time, and our understanding is constantly evolving. An efficient and powerful lower half definitely isn’t seen in the old “stay tall and fall” idea. Can someone tell me how that is even possible? On the other hand, the idea of “drop and drive mechanics” isn’t exactly accurate either. Every pitcher’s depth and timing will be different. The OBJECTIVE feedback – the target, the radar gun, the absence of pain, and the hitter – will tell you exactly when that moment occurs. 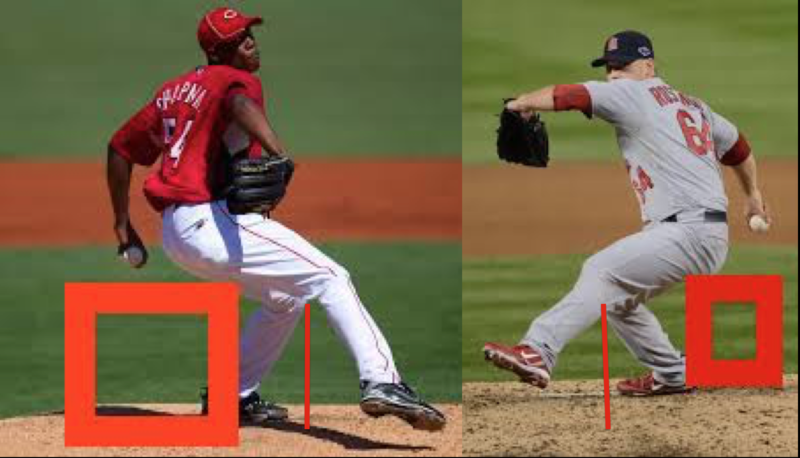 Check out the depth of the glute load on these two prolific power pitchers. Chapman is 6’7” tall and Rosenthal is 6’4”. Or they could just get into their glutes and throw 105 and 101 mph, respectively. Notice something else about these two guys? Look at how the back knee is not very far forward of the toe. That means they’re loading their glutes. When you bend your back leg with your knee significantly forward of your toe, you load your quads. Stand up and bend your knee so that when you look down at you foot, your knee obscures the view of your toe. Now take your hand and test the tension in the front of your thigh as opposed to your glutes. Your quads are more active than your glutes, right? Bend your knee, but this time, look down at your toe and make sure your knee doesn’t block its view. Test the activity of quads versus your glutes. You glutes are more active, right? The quads are designed for one thing, extending the knee. As such, the quads are excellent for pushing and leaping forward, but they are not good at sitting, riding and rotating. That’s the job of the glutes. So how does one activate the glutes? For a long time, we took our lead from weight lifting cues. In the gym when doing squats or bridges, you can activate your glutes by driving your weight through your heels. We had guys lifting their toes, or putting wedges under the forefoot to get them toward their heels to activate the glutes. Then my friend, Matt Furey, a world Kung-Fu champion, asked me a question. That’s when he showed me a picture in an ancient martial arts manual depicting a foot standing on top of an inverted iron pyramid. The pyramid was the length of the foot and the width of the foot and it reached an apex a few inches under the center of the arch of the foot. “You want to tell your guys to drive the point of that inverted iron pyramid right under the rubber. That will give them the most ground reaction force possible.” Matt said. At the same time, Houston Astros MLB pitching coach, Brent Strom told me about the latest instruction long drive golfers were receiving regarding keeping their back foot flat on the ground for as long as possible to get more length. 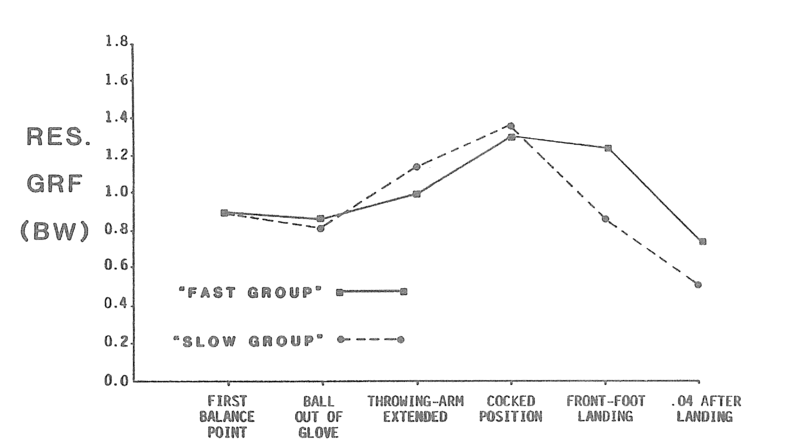 Two different sports with the same goal (GRF) advocating the same maneuver – that raised my index of suspicion. So I started looking a little closer at video. Check out this slide I’ve used in my presentations for a little over a year and a half now. Notice how all of these prolific power pitchers’ lead legs are almost to foot plant, and they still haven’t rotated to the ball of their foot yet? Notice how his lead foot is at about the same position and he has already rotated to the ball of his foot? When I showed this to the NY Yankees coordinators, coaches and training staff a few weeks ago, they recognized the uniform as that of their AA affiliate in Trenton, NJ. They actually knew the guy in the picture and said he was a low 90’s lefty. Since he’s quad dominant, his lower half doesn’t provide adequate energy, so he finds a substitute in his upper half by way of an inverted W.
He’s looking for energy in the wrong place. I’ve seen a few tweets/GIFs as of late, and I’ve read a few things on the internet with authors suggesting the inverted W is a lower half problem. Brent Strom, Coach Wolforth and Flint Wallace have been advocating this for years also. Improve this guy’s glute activation, and he wouldn’t feel the need to find energy in the inverted W.
At this point I also recalled a 1988 study in The Journal of Applied Biomechanics that showed slow throwers reaching an average peak ground reaction force earlier than hard throwers, but it fades quickly. Hard throwers, on the other hand, reach their peak ground reaction force later, but it is sustained for a longer period of time. They generate a lot of ground reaction force with their initial surge as they leap off the rubber, but when their inverted pyramid is disconnected from the ground, their GRF plummets. The hard throwers ride their glutes longer, so they reach peak GRF later. As they ride, their GRF is sustained and ultimately more velocity is generated. When we deployed the “inverted iron pyramid” among our students, we saw some immediate increases in velo, and a lot of arm action inefficiencies were eliminated. But soon, I became aware a few more positive effects from the “pyramid”. There was some merit to the observation. Many hard throwers do have front foot landing points farther away from the rubber than their softer throwing peers, but it has nothing to do with the length of their stride. They land further out because they ride their glutes longer, thereby creating greater and later GRF, giving them more velocity. You stride longer by staying connected, keeping your inverted pyramid in the ground and defying gravity with your center of mass until your front foot finally hits the ground. I also began to notice something else. Many of the quad dominant guys I observed either landed toward their arm side, or they demonstrated lead leg disconnections, early torso rotations, or postural disconnections. You see, when you shift your weight toward the ball of your foot with your first move, you project yourself to the arm side of midline. Here you have a few choices. You can land with your foot on the arm side of midline and “throw across your body.” Or you can open your lead leg, prematurely rotate your torso, or lean hard with your trunk toward your glove side to correct your directional deviation. For years, many coaches (myself included) tried to address the landing point by drawing that confounded line in the dirt with our shoes, or by taping a line down the middle our indoor portable mounds. We worked hard on correcting the lead leg disconnections, the early torso rotations, and the postural disconnections. But what we didn’t understand is that the landing point, or the disconnection created by the directional correction was only the runny nose and the sore throat. The virus was back at the inverted iron pyramid. If you get that inverted pyramid under the rubber and drive the arch of the foot into the ground, there is only one direction for you to go, and that is directly toward home plate. 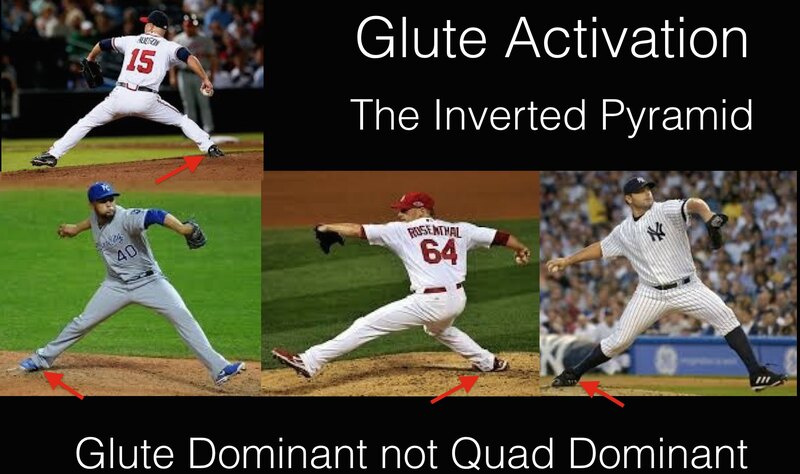 Glute dominant guys tend to project themselves toward home plate. Quad dominant guys tend to land toward their arm side, or they exhibit some sort of disconnected directional correction. Driving the inverted iron pyramid into the ground is now the single cognitive thought I allow my pitchers to make. After that, it’s all subconscious. Get that inverted pyramid right and a lot of good things happen downstream. So how is your inverted pyramid? Why not come to Tampa, let us check it out, and work with you on drills and exercises to create a more efficient and powerful lower half? 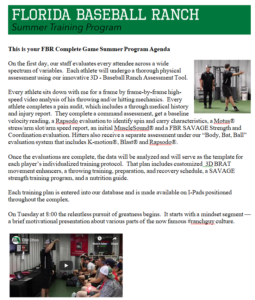 Come to one of our Elite Performers Boot Camps this summer or fall. You’ll see a significant bump in your velo, and you’ll eliminate a lot of stress from your arm, reducing your risk of injury. Can’t make it to a camp? Call us and get registered for a Precision Strike 1 day 1-on-1 evaluation and training session. I’ll be standing here with both pyramids planted firmly in the ground, waiting for your call. Hi Alan, Thanks for the kind words. I do believe the iron pyramid concept applies to all position players.